Unless you’re hoping to sample a Dough-sant. Then get ready to wait in not one, but two giant lines. This was probably the new food I was most excited to try at the fair. I felt this year was a little “blah” in terms of exciting new culinary ventures, but when I heard I would finally get to try the much hyped cronut sibling from French Meadow, I was pumped. Sadly, the real deal didn’t live up to the myth. While the dough-sant had that buttery, delicious croissant flavor, it was fried into crispy disk – more like a wafer than a doughnut. We were all hoping for a crispy exterior with a doughy center, but all we got were a series of flakey croissant chips that left us wondering if it was worth the wait. 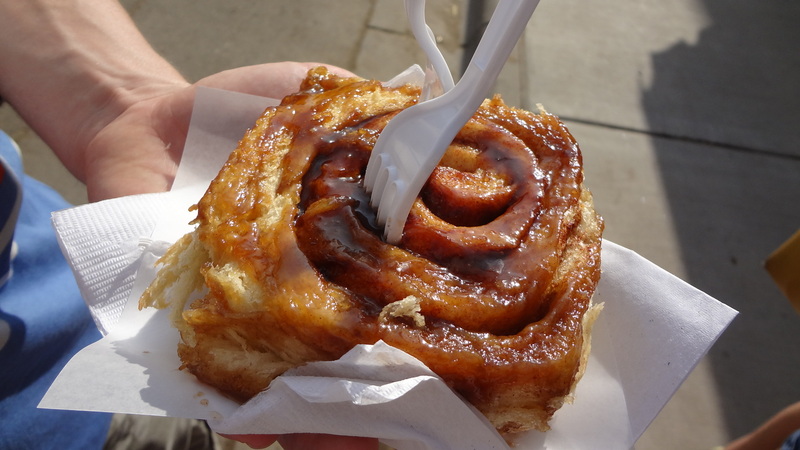 Feeling less than full after our breakfast, we dove into this caramel sticky bun from Buni’s bakery next. I usually pass this tiny stand by, but my boyfriend had a craving, and I’m so glad he did! The roll was perfectly cooked, soft and easy to chew, without the hard, crusty edges you sometimes get. And the caramel sticky sauce was perfect. Not too heavily sauced and not too sweet. Very eat-able and very dangerous! 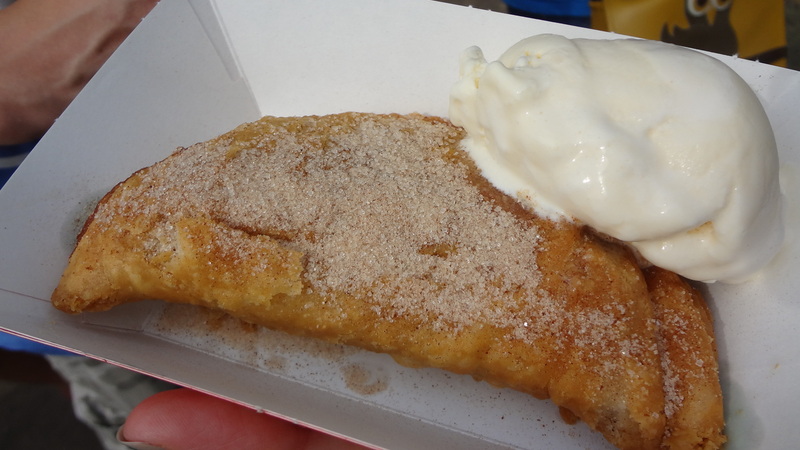 We soon moved on to my favorite new food thus far – the deep-fried pumpkin pie from Minneapple. While the dough-sant left much to be desired in terms of heft on the inside, the pumpkin pie was superb. The fried outer crust is perfectly flakey, and the creamy pumpkin pie center had just the right amount of spice. If you’re someone who worries about the pie to crust ratio, let me tell you, there is nothing to fear with this pie. The edges of the corners are mostly crust, but nobody skimped on filling these babies up! Because I guess breakfast and dessert shouldn’t be the only things we eat in a day. Sadly, this North Woods BBQ taco from San Felipe Tacos was another miss from the new foods category. 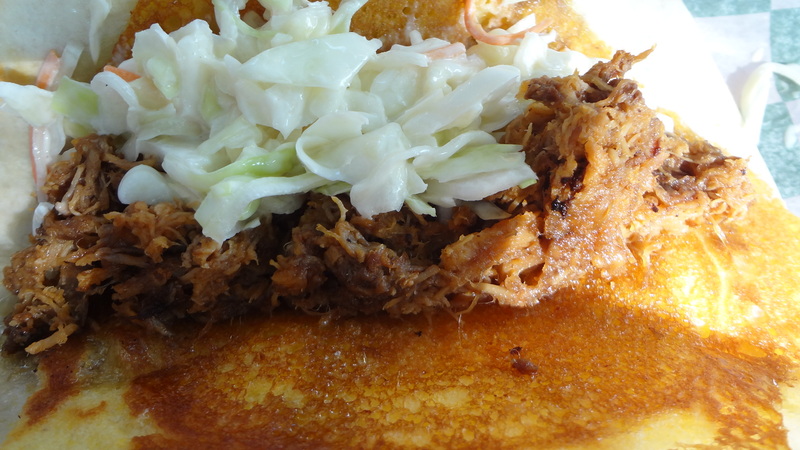 BBQ pulled pork, topped with slaw and wrapped in a corn pancake sounds super good in theory! But not so much in practice. The slaw was good, the meat was just ok and probably needed a little more sauce, but the pancake/tortilla combo is where they lost me. The corn pancake was far too sweet, and really threw off the flavor balance of the taco as a whole. It was also completely melded with the tortilla, leaving us all with a consensus of the taco tasting “weird”…and not in a good state fair “weird” sort of way. I’ll be heading back later this week once the brutal temps drop and my tummy is once again in fighting form. 1. Culligan’s water station. Right by the main entrance on Snelling, the lovely Culligan water people have free water. You can even refill water bottles if you’re skilled enough to use a cup – no germy water bottles are allowed to be refilled directly from the tap, but you are welcome to as many cups as you like. 2. Parts of the Coliseum are most definitely air conditioned. Wander the vendor halls specifically to enjoy the cool breezes. 3. The kiddie room located just off the Miracle of Birth barn is also substantially cooler than the barn itself. 4. If you’re on Machinery Hill, there are some killer high-power fans equipped with misters that are fabulous to stand in front of. 5. If you’ve made it all the way to the pet center, enjoy the open tap at foot level. Probably meant for thirsty pets, but an excellent way to cool off hot toes. 6. And finally – wear a hat and sunscreen! Seriously. Just do it. 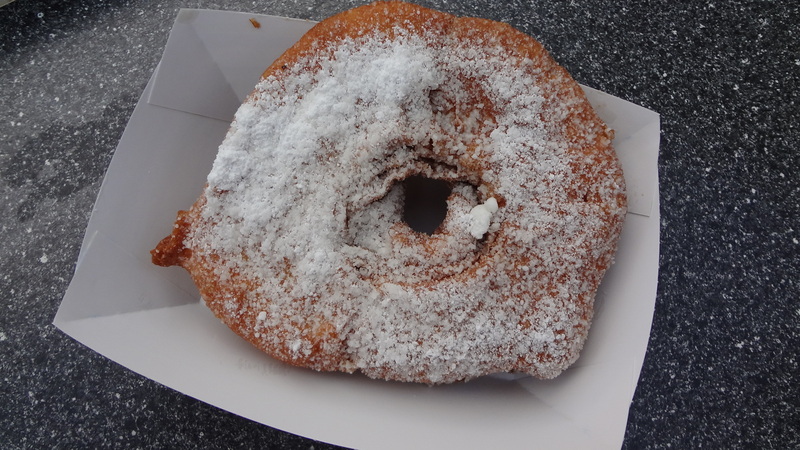 This entry was posted in Uncategorized and tagged caramel rolls, deep fried pumpkin pie, dough-sant, dough-sant review, food reviews, Minnesota State Fair, Minnesota state fair new foods, north woods BBQ taco, san felipe tacos by theculinarycapers. Bookmark the permalink.